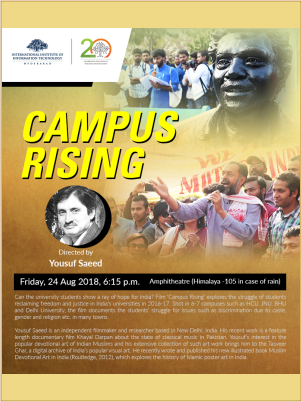 The film Campus Rising by Yousuf Saeed, will be featured on 24 Aug 2018, 6:15 p.m at Amphitheatre (Himalaya -105 in case of rain). Can the university students show a ray of hope for India? Film ‘Campus Rising’ explores the struggle of students reclaiming freedom and justice in India’s universities in 2016-17. Shot in 6-7 campuses such as HCU, JNU, BHU and Delhi University, the film documents the students’ struggle for issues such as discrimination due to caste, gender and religion etc. in many towns. Yousuf Saeed is an independent filmmaker and researcher based in New Delhi, India. His recent work is a feature length documentary film Khayal Darpan about the state of classical music in Pakistan. Yousuf’s interest in the popular devotional art of Indian Muslims and his extensive collection of such art work brings him to the Tasveer Ghar, a digital archive of India’s popular visual art. He recently wrote and published his new illustrated book Muslim Devotional Art in India (Routledge, 2012), which explores the history of Islamic poster art in India.